One Inch Square has changed hosts. 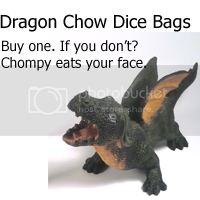 You can now find it at OneInchSquare.net. DM Tip: "Tell me how it dies"
This tip comes courtesy of my DM, @WolfSamurai who in turn got it from his DM, @DMSamuel, and is a quick and easy way to engage your players. When a player character kills a monster, instead of describing its untimely end yourself, turn to your players and say, "Tell me how it dies." Passing off this small bit of narrative to the players empowers them, allowing them to roleplay their hero's triumph, and revel in the gory (or whimsical) details. You've also offloaded a small part of your already tremendous workload, freeing up some mental bandwidth for more important tasks (like rallying your minions to show those pesky PCs who the king of the dungeon really is). You will probably want to save the narration of your unfortunate villain's fate for yourself, but your players will likely find being handed some narrative control is rewarding and fun. Little things like this help engage players, allowing them to feel more immersed in the action and more like active participants in the story rather than passive bystanders. 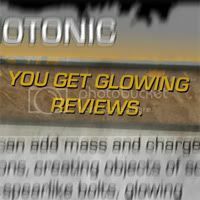 Since there have been a few requests for blank versions of the One Inch Square Gamma World Origin Cards I have uploaded the backgrounds I made/modified. 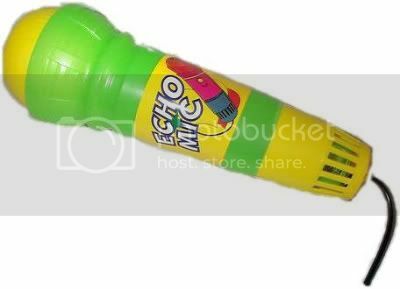 The images are in PNG format. Enjoy. With the release of the final Gamma World expansion, Legion of Gold, I have produced a series Character Origin cards in the same style as the Famine in Far-Go cards and Core Rulebook origin cards I released previously. These cards are a tool to speed up character creation and aid play. 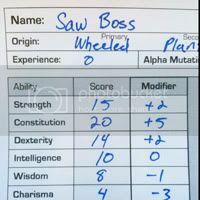 Have your players roll their origins and then hand out the appropriate cards to them. 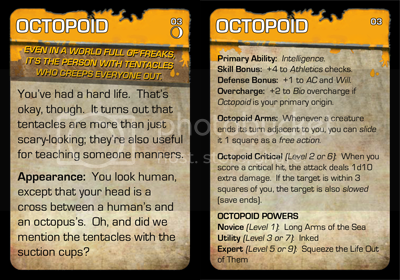 These double-sided cards reprint almost all of the information found in the origin section of the rulebook, including the origin's name, description, full trait information, critical hit ability, and power names. 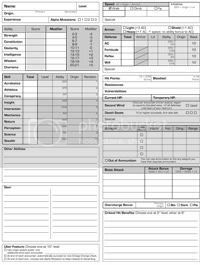 They contain all the information a player needs while creating their characters and serve as a handy reference during play. Since power descriptions are too lengthy and really deserve their own cards, I have only included their names. "The moon now shone upon the grey face of the rock; but they could see nothing else for awhile. 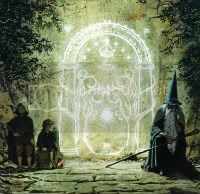 Then slowly on the surface, where the wizard's hands had passed, faint lines appeared, like slender veins of silver running in the stone. At first they were no more than pale gossamer threads, so fine that they only twinkled fitfully where the Moon caught them, but steadily they grew broader and clearer, until their design could be guessed." Invisible letters and glyphs are a great fantasy trope and can make for really interesting and engaging props in your game. In your world, the letters or symbols could be drawn in Mithril ink that is only visible by moonlight, arcane magic that is triggered by word or touch, or simply disappearing ink that's exposed by heat or chemical reaction. It could be a map, a secret door, a spell, or coded instructions from the king. Invisible ink markers seem to be hard to come by these days, but I was able to find a company online that sells them. Unless you have a black light at home already, you'll also need something like this mini black light keychain to reveal the ink. Other than that, all you need is some paper (see tips below). Draw up an invisible map or letter, hand it out to the players at the appropriate time, and watch them puzzle over this mysterious prop. Don't give them the light, of course, until they've determined how (in game) to make the letters appear. The hidden letters are easier to see under blacklight when the room isn't brightly lit. A good excuse to turn down the room lights for atmosphere. I wouldn't recommend drawing on your vinyl battlemaps with an invisible ink pen as it's unlikely to come off. It should, however, work on Gaming Paper. 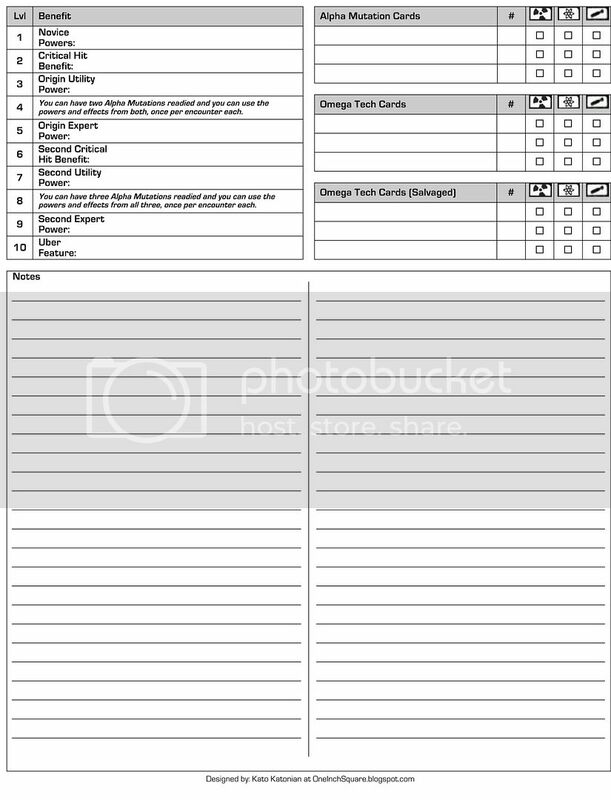 The front side features just about every bit of information you'll need in front of you during play. The most important items are highlighted with a bold border to help them stick out. Sections that are used in creating the character but aren't directly referenced in game (e.g. the columns of various bonuses for skills) are slightly greyed to set them off. Wherever possible, hints are given in cells to show where a particular bonus or bit of information should come from to speed up character generation and add clarity. Here's an example of the front side filled for a first level character. The back side has a place for the player to record which powers, etc., they've taken at each level as well as a large area for notes. There are also places to record which Alpha and Omega cards the player has in order to keep track between sessions. 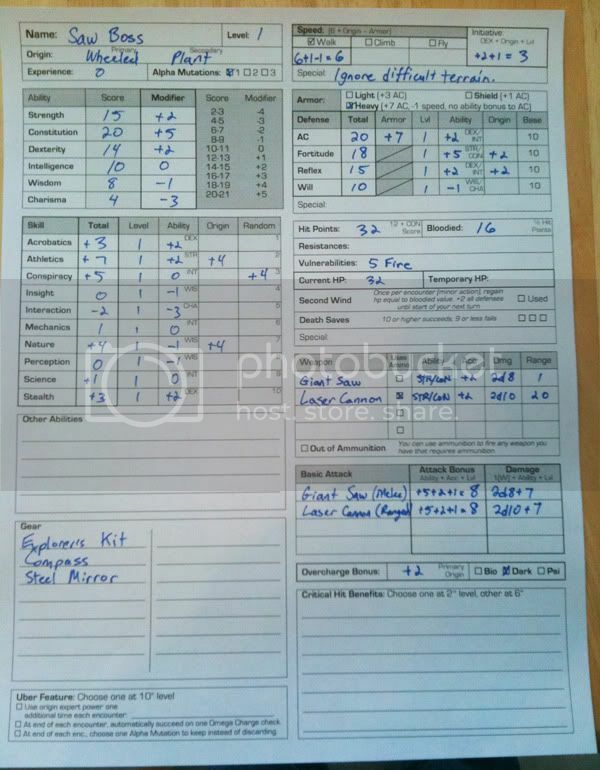 The character sheet does not have space for power descriptions (though one could use the "notes" section) as it is assumed that players are using some sort of cards or printouts with that information on it. 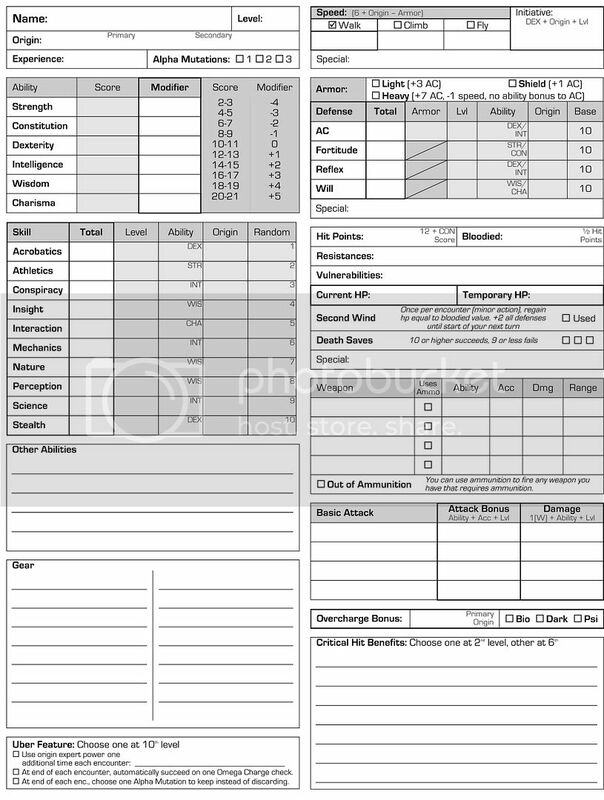 And of course I recommend the Character Origin Cards found on this blog as an aid in character creation and play.